The discipline of risk management has become more complex and diverse than ever, driven in large part by new regulatory mandates, an explosion of technological and financial innovation and the growing interconnectedness of global markets. Today’s risk managers are analyzing, measuring and quantifying the impacts of an expanding list of risk categories, including operational, systemic, technology, vendor, business continuity and physical risk. This evolution of risk management is essential because firms need to have a deeper understanding of all aspects of the risks they face as well as the intricate spider’s web of interconnections they create. In this new paradigm, risk managers can no longer view financial firms as stand-alone entities because, in reality, they are now a diverse set of interconnected components that distribute risk and are exposed to it, oftentimes in ways that are not transparent or expected. Furthermore, the openness and complexity of the financial ecosystem and the likelihood that breakdowns will occur mean that firms must do more than monitor and mitigate these risks – they also need to focus on building resiliency so they can detect potential systemic shocks before they strike or recover from them as quickly as possible. 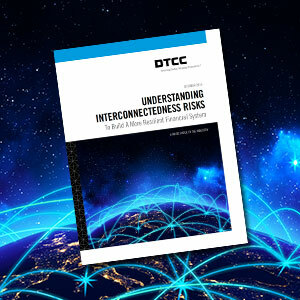 Click here to read the white paper “Understanding Interconnectedness Risks”.